Gary and I have enjoyed hiking for a long time. When I got sick, hiking really came to a halt. Once I started feeling better, we started doing short hikes in terrain that involved little elevation change, mostly at Creasy Mahan, a lovely little nature preserve in Oldham County, Kentucky. The one constant before and after has been back pain. I have never had a backpack that fit me correctly. Mostly, I just had Gary carry whatever we were hiking with, and since those hikes were mostly short, in consistent weather, it was fine that I didn't carry my own pack. Now, however, I need to carry my own pack, and have no desire to experience loads of back pain. Enter Dominic's back pack. Last fall, when we bought the boys new backpacks, Dominic chose a women's backpack because that's what fit him best at the time. Now, however, he's grown about 6" and it no longer fits him properly. Fortunately, it fits me like a dream. Yesterday, after we had been hiking for about 2 hours, I realized that I didn't feel as though I'd been carrying a backpack for 2 hours. In fact, I didn't feel like I'd been carrying a backpack at all. The backpack design actually seemed to help support my back instead of pulling down on my shoulders. Glory be. Seriously, I've tried on so many different backpacks in the various outdoor stores we've visited throughout our marriage (Gary's been a member of REI since long before we met) and never found one that fit quite right. Not only did I not experience any pain, but I was able to shove everything I needed into that backpack- poncho, snacks, hiking boots, socks, sweat shirt, leggings, water bladder, camera, phone, first aid supplies, tissues... I think that was all. The only pain I have from yesterday is a little hip pain from going up and down the trail. I did roll out my muscles on a foam roller last night and this morning, but this is a huge win for me, especially considering that we hiked for 4 hours with an almost 2000 foot elevation change. Gary wants us to be 14ers. I may just try, but first, Ice Lake. 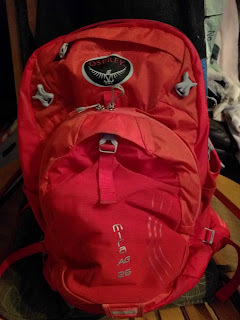 The backpack I used is an Osprey Mira AG 26 Hydration Pack. I am now looking at their trail packs in the interest of doing some trail camping next summer. A couple downsides- It squeaks. At first, I thought I was doing something wrong. If someone can walk into a sliding glass door, they can do something wrong with a backpack. But, reading other reviews on Amazon tell me that this is a common problem. I'll take it, though. It's not loud (to me) and it wasn't irritating. Secondly, at some point, Dominic managed to break off the magnet that holds the bladder spout to the strap. I'm not sure if it's a flaw in the design or if Dominic played with it a lot. Regardless, it doesn't reduce the functionality in my eyes.